Designed by Toddy Gear, The Wedge is a stylish and colourful promotional desk accessory to hold your mobile phone or tablet and promote your business at the same time. The branded stand is designed with a perfect angle to use your mobile device and also cleans smudges from the screen. The Wedge promotional mobile device stand is full colour printed with your company's logo across the entire top surface of the product so that your brand can be seen by all as well as it being an attractive desk accessory. The stand also comes with a choice of a Black or Ash microfibre bottom which removes dirt from your device's screen. If stylish desk accessories are for you, why not check out our Foldy Mobile Phone Holders or Moby Pad Phone Holders. 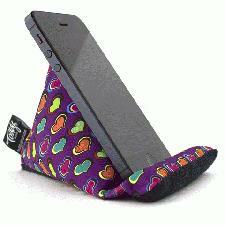 For enquiries on The Wedge Mobile Phone Stand fill in the form and we will get straight back to you.